Since its beginnings in 1985, the movement to raise breast cancer awareness has consistently gathered momentum. 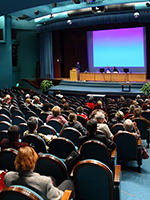 The Annual Meeting of the American Society of Clinical Oncology (ASCO) is the largest and most important oncology specialty meeting in the United States, and arguably the world. More than 30,000 oncology professionals gathered in Chicago, IL, to hear about ground-breaking research, state-of-the-art treatment modalities, new therapies, and ongoing controversies in the field. The severity and impact of nausea and vomiting (NV) on patients undergoing chemotherapy and radiotherapy is greater than estimated by oncology physicians and nurses, according to research presented by Cheryl Vidall at the 2015 Multinational Association of Supportive Care in Cancer/International Society of Oral Oncology International Symposium on Supportive Care in Cancer. Young adults (YA) with cancer are a unique population with special needs. Nurses can play an important role in addressing the psychosocial needs, as well as the physical needs, of this population. The Billings Clinic Cancer Center in Montana offers expert multidisciplinary care for patients with cancer. 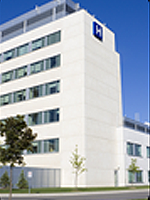 The center’s team approach to care includes physician and nurse specialists in oncology/hematology, patient care navigators, counselors and social workers, dietitians, a genetic counselor, and a naturopathic physician. 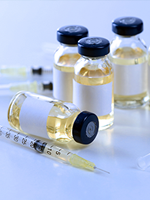 Vaccines are also being studied in melanoma and other cancers. These vaccines are engineered to educate the immune system. Nutrition intervention can help minimize the number of complications patients may experience during oncology treatment. 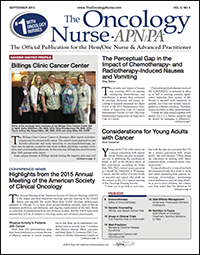 In this month’s issue of The Oncology Nurse-APN/PA (TON), we wrap up our coverage of the news from the recent Oncology Nursing Society (ONS) 40th Annual Congress and the 2015 Annual Meeting of the American Society of Clinical Oncology (ASCO).